"We know too well that our freedom is incomplete without the freedom of the Palestinians." "The issue of a principled commitment to justice lies at the heart of responses to the suffering of the Palestinian people and it is the absence of such a commitment that enables many to turn a blind eye to it." US corporations continue to operate in South Africa because it is profitable. Apartheid makes it very profitable. These corporations pay millions of dollars in taxes which pay for the police, prisons, weapons, and armaments that maintain the apartheid system. They sell the government its armored personnel carriers, its computers and communications technologies. Westinghouse has sold South Africa several licenses for the manufacture of nuclear power facilities. And every US industrial facility is integrated into the civil defense plans of the South African government...includ[ing] turning over its facilities for military production at the direction of the South African government. Perhaps we should try disinvestment. I think a policy of sanctions would harm the very people in South Africa you are trying to help...I agree with a policy of trying to influence South Africa by other means. The present Government is moving forward in the direction we wish them to go, faster than any other. Sanctions will harm, not help. It is now commonly accepted that her view (and Reagan's, of course) was wrong, both morally and strategically. Apartheid was hugely profitable then, just as the Israeli occupation of Palestine is immensely profitable now. The United States, Britain and Israel all maintained lucrative economic and military relationships with the Apartheid regime long after the rest of the international community heeded the call to boycott and divest. 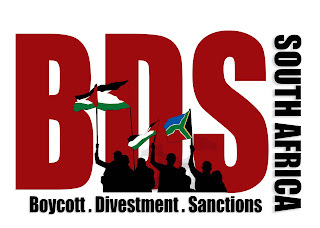 Barak Ravid pointed out in Ha'aretz last year that, by 1987, "Israel was the only Western nation that upheld diplomatic ties with South Africa" and was one of the last countries to join the international boycott campaign. A few years ago, Archbishop Desmond Tutu noted the absurdity of opposing boycotts under the banner of solidarity with the victims of apartheid. Countless universities around the world, which have since honored him with honorary degrees, had previously punished their own faculty members for anti-Apartheid political activities and "refused to divest from South Africa because 'it will hurt the blacks' (investing in apartheid South Africa was not seen as a political act; divesting was)," Tutu wrote in South Africa's Times. "Let this inconsistency please not be the case with support for the Palestinians in their struggle against occupation," he pleaded. It has been argued that Non-White people will be the first to be hit by external boycotts. This may be so, but every organisation which commands any important Non-White support in South Africa is in favour of them. The alternative to the use of these weapons is the continuation of the status quo and a bleak prospect of unending discrimination. Economic boycott is one way in which the world at large can bring home to the South African authorities that they must either mend their ways or suffer for them. This appeal is therefore directed to the people of Great Britain to strike a blow for freedom and justice in South Africa and for those whom the State would keep in continuing subjection in the Union. In her staunch opposition to joining the boycott campaign, Thatcher argued against effectively punishing the culprits of severe discrimination and oppression for fear that such actions would backfire and stem chances for positive change. She was against the international arms embargo on South Africa, claiming in 1964 that such sanctions would have "far reaching adverse effects." In late 1977, Thatcher declared, "In my view, isolation will lead only to an increasingly negative and intransigent attitude in the part of white South Africa." I don't think that it makes any sense to put negative pressure on people whose behavior you hope to change. I think that the way that Israelis will feel comfortable making the compromises and the sacrifices--and Israel as a whole, not just the settlers --is when they really feel that not only American Jews, but the United States, is going to be there for them. I think if you begin to do things that say, 'We're not really with you, we're against you, we're putting pressure on you,' I think that causes people to pull more into a shell and pull back...Rather than it making you more inclined to do something, it actually makes you less inclined. ...you can't use boycotts, you can't threaten aid, you can't use these kinds of forms of negative pressure. I think you're right to extrapolate. It is all of a piece that these negative approaches to trying to get people to do something you want them to do, we've lumped them all together for four years and said, this doesn't work. What you need to do, I often call it positive pressure instead of negative pressure. Positive pressure means actually giving people hope and something to believe in again. Ben-Ami's "positive pressure" is the new "constructive engagement," reinforcing the current power dynamics of occupier and occupied, bending over backwards to assuage the bigoted fears of Israeli Jews, fomented and internalized by decades of propaganda and privilege, while ignoring the call of solidarity with the real victims of ethnic, religious and racial oppression. Just as it was with South African whites, liberal Zionists need to understand that "security" and "peace" doesn't spring from separation, militarization and mutual concessions by two vastly unequal parties, but rather from the repudiation of ethnocracy in favor of equal rights and the acknowledgement of wrongdoing in order to begin rectification and reconciliation. Ben-Ami seems to think the occupation will end simply by hugging Jewish Israelis - including settlers - tightly enough. Beyond this, as I've noted in the past, Ben-Ami's opposition to "negative pressure" only extends to his own tribe; Iranians, of course, don't get such a compassionate plea for positive reinforcement when it comes to their nuclear program, which doesn't violate international law, as opposed to Israeli colonization of Palestine, which does. On the floor of the House of Commons, on June 5, 1984, Marlow wondered, "Is there not something bogus about the hue and cry from the Opposition about the visit of Mr. Botha when not a whisper was raised against the visit of the President of Israel? In moral and physical terms, there is very little to choose between those two regimes." Thatcher contested his analogy and affirmed her support for "constructive engagement." She confidently stood her ground on the wrong side of history. Nearly two decades later, liberal Zionists who oppose BDS are standing alongside her. "Beyond this, as I've noted in the past, Ben-Ami's opposition to "negative pressure" only extends to his own tribe; Iranians, of course, don't get such a compassionate plea for positive reinforcement when it comes to their nuclear program, which doesn't violate international law, as opposed to Israeli colonization of Palestine, which does."